Lithgow Zig Zag - Historic News Reports - Blue Mountains Australia - Railway History. 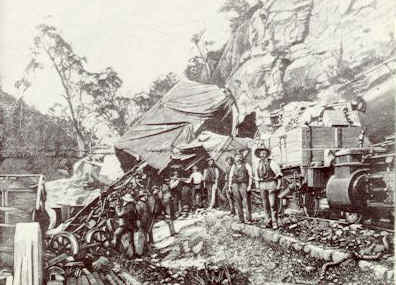 Bowenfels-Sydney train of 1871 backing up the middle road of the zig zag. Note the lack of shelter for enginemen. THE ZIG-ZAG CROSSING THE BLUE MOUNTAINS, NEW SOUTH WALES. Amongst the most interesting, excursions out of Sydney may be mentioned a visit to the Blue Mountains and the "Zig-Zag"
Perhaps on no other railway in the world is there a more striking instance of difficulty overcome or a finer specimen of skill, than is presented in the Lithgow Valley Zigzag. 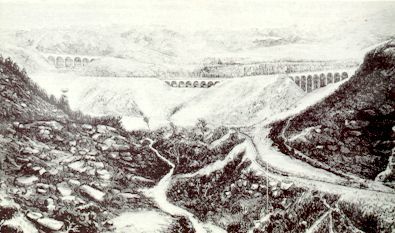 In order to understand in some degree the enormous obstacles that stood in the way of railway extension to the western interior, it is necessary that the reader should know that the line had to be carried over a barrier line of mountain cliffs, so rugged and precipitous, that, for fully twenty-five years after the settlement of the colony, it defied the passage of human beings. 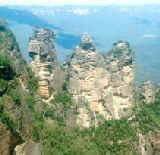 But the surface of the Blue Mountains is, so to speak, scored with vast chasms and deep ravines, with precipitous walls of rocks on each side. Narrow, gloomy and profound, these stupendous rents in the bosom of the earth, are enclosed between gigantic walls of sandstone and rock, sometimes receding from, sometimes frightfully overhanging, the dark bed of the ravine, and its black, silent pools, or its foaming torrents of water. Many of the precipitous sides of these ravines have a depth of 1500 feet. The average height of this portion of the dividing chain is about 3300 feet, though some of the peaks attain a somewhat higher elevation-the highest being Beemarana, 4100feet, at the head of Campbell's river. Such is the character of the country where the Zigzag is situated. The course of the gully down which the railway line in thus brought, if about E.S.E. to W.N.W., and westward of it, a similar gully, still in its savage grandeur, will enable the visitor to form an approximate idea of the difficulties that have been overcome. The descent from the Mount Clarence Range into the Lithgow Valley commences- . . . Illustrated Sydney News, May 15, 1871 p81. One of the most impressive sights and grandest bits of engineering in the worldone, too, which will lose little by comparison with that wonder of the 19th century, the trans-continental railway of Americais the Great Zig-zag at Mount Victoria, on the Western line of New South Wales. This magnificent work, which can be best inspected from the stand point taken by our artist at the bottom of the gully in the foreground, is cut out of the solid rock which formed the side of the terror of teamsters in days gone by, and cost about £25,000 per mile. In its passage across the Blue Mountain Range, the railway as a rule follows the track marked out by Messrs. Wentworth, Lawson, and Blaxland, till it reaches the extreme end of Mount Victoria, where the descent into Lithgow Valley commences, which feat in accomplished by means of three zig-zag lines formed in the precipitous face of the mountain, whose total height above sea level is nearly 4000 feet. The difficulties which had to be overcome by both engineer and contractor were very great, but the result of their combined labours is a spectacle which commands the admiration of every traveller in N.S.W. whose business or pleasure takes him from the metropolis to the western districts of the colony. The features of the country were such, the cliffs no high and precipitous, that the surveyors who were engaged in marking out the line had to be lowered from the rocks above, and the contractor had to commence his labours in the same way. Mount Clarence Tunnel, situated on the Sydney side of the Zig-zag, is the first construction of importance in connection with this gigantic work; it is cut through hard rock, lined with masonry throughout, and is 539 yards in length. From Clarence Tunnel to the bottom of the Zig-zag in Lithgow Valley the fall in 687 feet, and the total length of line in which this descent has been accomplished by the method employed is under five miles. Illustrated Sydney News, March 28, 1874 p14. The zig zag looking up Lithgow Valley Creek from Farmer's Creek showing one track on the lower road. The scene at Bottom Points, after aproximately 15 trucks and 2 brake vans broke free from a goods train and rolled 70 chains down the 1 in 42 gradient. The guards stuck to their posts and applied the brakes, but with little effect. Both guards escaped without serious injury. Five trucks and one van were completely smashed, every foot of timber being broken in some of them. Goods were strewn all over the line for 200 yards. 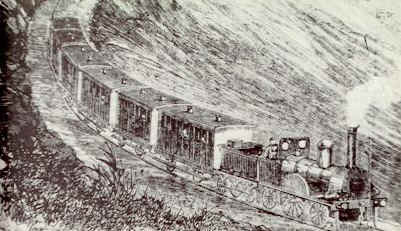 The runaway goods train smash at Bottom Points, from a picture by F. West. Copyright 1997-2003, David Martin, except where other copyright applies. Company & brand names are the property of their respective owners. Established 1996 - originally "Blue Mountains Plaza".